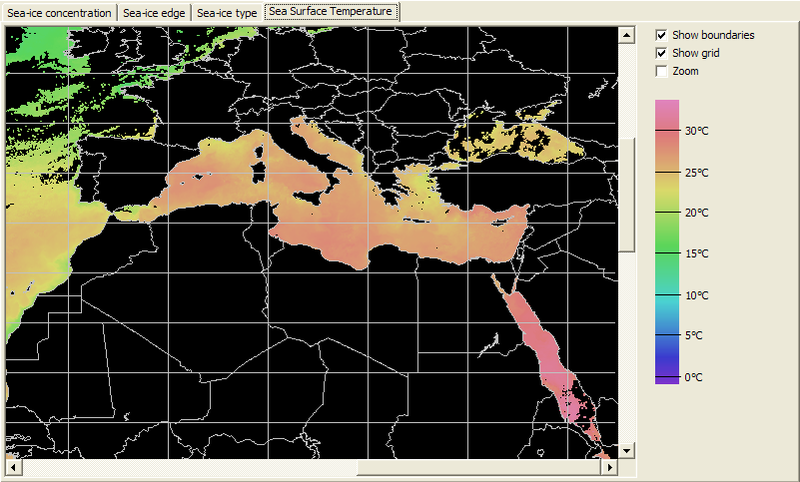 What is the Sea-Ice & SST Viewer? 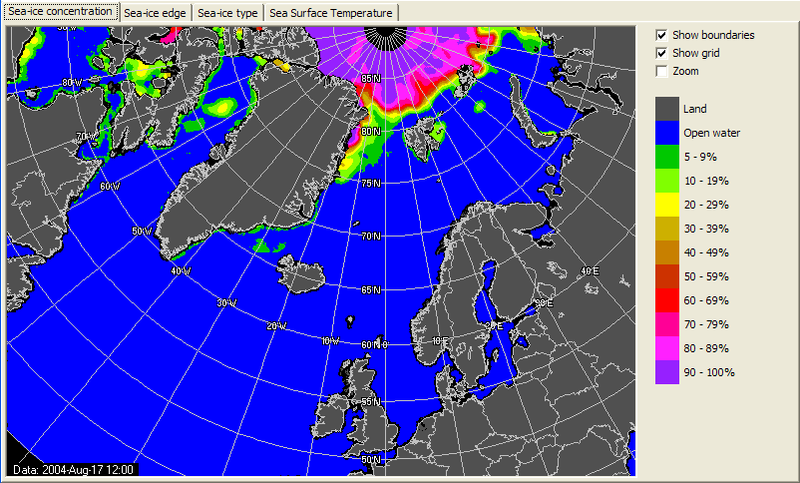 The Sea-Ice Viewer visualises the sea-ice data covering the northern polar region. Three presentations are available: sea-ice concentration, sea-ice type (old or new), and sea-ice edges (open or closely packed). OSI-SAF data available from the EUMETCast system (as used for Meteosat-8 reception) or data FTPed from the Internet (ftp://saf.met.no/prod/ice/). Because the sea-ice data is only sent once per day, between 04:00 and 04:30 UTC, unless you run your system 24 hours per day you may miss the data. For this reason, you may need the FTP service from Norway. If you want to automate the FTP downloads, please contact me for a suitable command-file. Further developments will be concentrated on the registered version. Please see the read-me file which comes with the program for more information about command-line operation and automating the registered version of the program. V1.4.2 Add support for southern hemisphere SAF-OSI data, build with Delphi 2009. V1.4.4 Support more data types (S-OSI_-FRA_-MTOP-GLBSST_FIELD, S-OSI_-FRA_-MTOP-NARSST_FIELD, S-OSI_-FRA_-NOAA-NARSST_FIELD), add these to the File|Open menu. V1.5.2 Add click for full image option, ensure that a single data type is displayed first. V1.5.4 Support new-format DMI Sea-Ice concentration data, support new name for concentration data, support multiple data types in new named data, remember form size and position between runs. Beta version: Data sources are changing - check here for the latest program update. EUMETSAT have announced that they are to discontinue OSI SAF SST products in GRIB format from 12 January 2017. A couple of alternatives have been suggested by Simon Proud, and reports of any experiences with these viewers would be welcome in the SatSignal self-help group.